Decimus Clodius Albinus was born at Hadrumetum in North Africa. His family was was of senatorial rank and we are told he was brought up in luxury accumulated by his ancestors. Albinus entered the army at an early age and held a succession of military posts before eventually becoming consul in 187 AD. This post was followed by his appointment as Governor of Lower Germany in 189 AD followed by Governor of Britain in 191 AD. 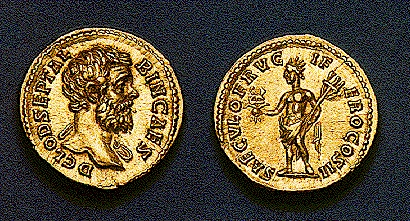 Clodius was well positioned in Britain by the death of Pertinax. His military strength included a garrison of three legions with a large body of auxiliary troops. Severus was a cunning individual with little integrity when it came to ambition. In order to secure his path to rule Rome, Severus managed to convince Clodius that he should support him and in return for his loyalty, Clodius would be given the rank of Caesar. 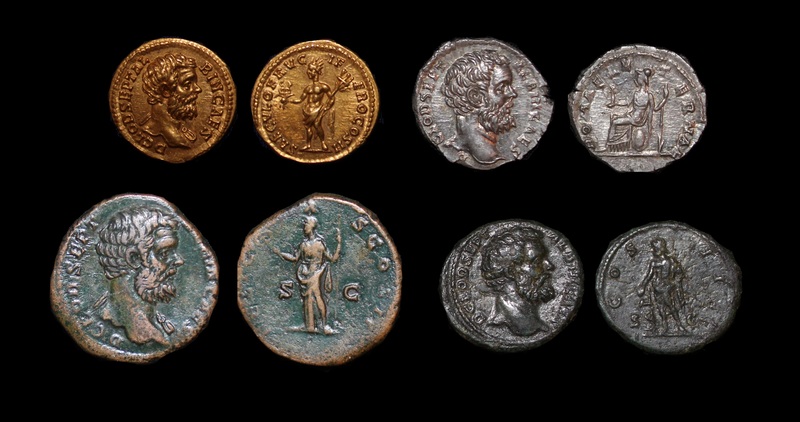 The majority of the coinage issued by Clodius at this time displays his accepted rank of Caesar. Severus sought to move against Rome and his mere march prompted the Senate to abandon Julianus prompting his execution. This allowed Severus to turn his attention to Niger in the East. Once Niger was defeated, Severus’ determination to be absolute master of the Empire was revealed. In 195 AD, Severus had Albinus declared a public enemy by the Senate. Clodius Albinus, after being played as the fool, withdrew to his former territory where he was saluted as Augustus by his troops. Clodius began to make preparation for the forthcoming struggle with Severus. After some initial success, Clodius was eventually defeated in a great and final battle fought on February 19th, 197 AD near Lugdunum (Lyons). Clodius later committed suicide. His body, along with those of his wife and children, who were also put to death, were thrown into the Rhine river. D . CLOD . SEPT . ALBIN . CAES. D . CLODIVS ALBINVS CAES. D . CL. SEPT . ALBIN . CAES.